2. Sprinkle the fillet of salmon with olive oil, salt, pepper. 4. 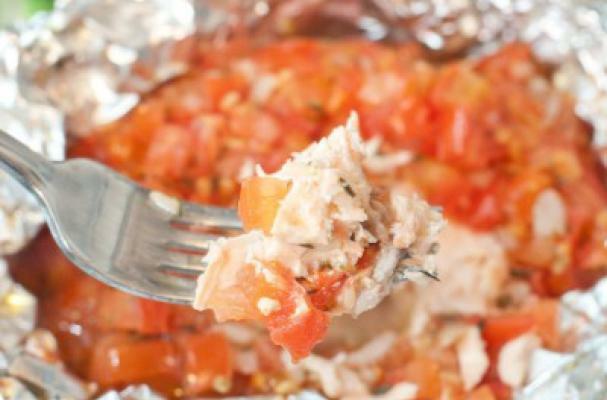 Put the fillet of salmon on a sheet of foil, with the oily skin side down. Bring the ends of the fillet together to make a spiral type shape. Next spoon the tomato mixture over the fillet and then fold the foil over the fillet and mixture. Put the foil packet onto a big heavy baking sheet – repeat this process if cooking for more than one person. 5. Bake for between 20 to 25 minutes, until the fillet of salmon is cooked through. Use a big metal spatula to place the foil packet/s onto a plate/s. Of course there are many varieties of salmon, and from one to the next the nutritional values will vary to some extent. However you can be sure with this easy, tasty recipe that you are getting a good source of protein that is considered by many to be a super food, as it is packed full of nutrients. Of all the fish types, salmon is the king when it comes to brain food!